We have three vehicles offering transportation: two 12-passenger mini buses and one 9-passenger van. All three vehicles are lift equipped to transport wheelchairs. 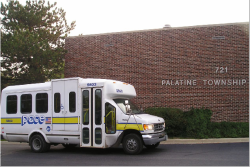 Two mini-buses and the van provide curb-to-curb service anywhere within the Palatine Township boundaries. In addition, all of our vehicles go to Arlington Heights on Tuesdays for medical appointments only. For seniors 60 and over and/or the disabled, the cost is $2.50 for a one-way trip. All riders must be pre-registered. You can register at Palatine Township Monday through Friday from 8:30 AM until 4:00 PM, and on Saturday from 8:30 AM until 12 noon. Documentation of age or disability (social security award letter), Driver’s License or State I.D., proof of residency, and a name and phone number of a contact in case of emergency. Reservations should be made three to fourteen working days in advance, during working hours (8:00 AM – 4:00 PM) Please let us know if you need the lift. Service is available 8:00 AM to 4:00 PM Monday through Friday (closed holidays and weekends). PALATINE TOWNSHIP TRANSPORTATION BROCHURE – CLICK HERE! PALATINE TOWNSHIP T.R.I.P. PROGRAM BROCHURE – CLICK HERE! PALATINE TOWNSHIP T.R.I.P. PROGRAM INSTRUCTION SHEET – CLICK HERE!